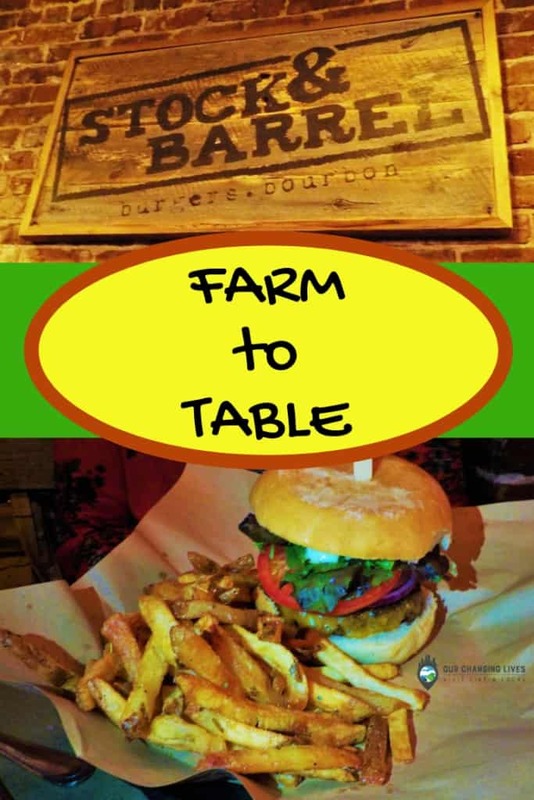 Farm to Table has become a catch phrase used by many businesses these days. 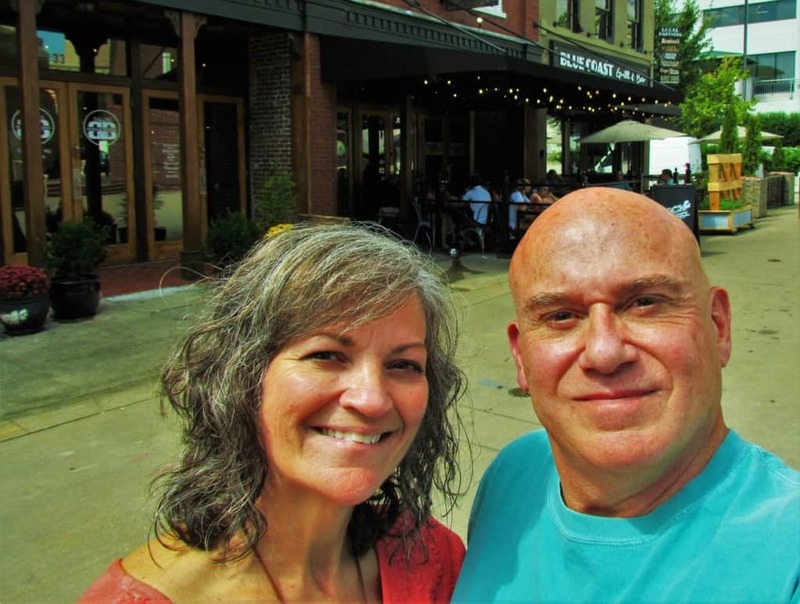 During a visit to Market Square, in Knoxville, Tennessee, we had an opportunity to taste what that phrase is designed to represent. Market Square is a fun destination, filled with eclectic shops and delicious eateries. We had scoped out the area before our arrival, and determined that Stock & Barrel was one of the restaurants that we had to sample. The principle behind the farm to table approach is fairly simple. Restaurants will source ingredients from local or regional growers to help ensure freshness and minimize the use of preservatives. While some will tout this feature, their end products wind up with more shelf-stable ingredients than fresh. 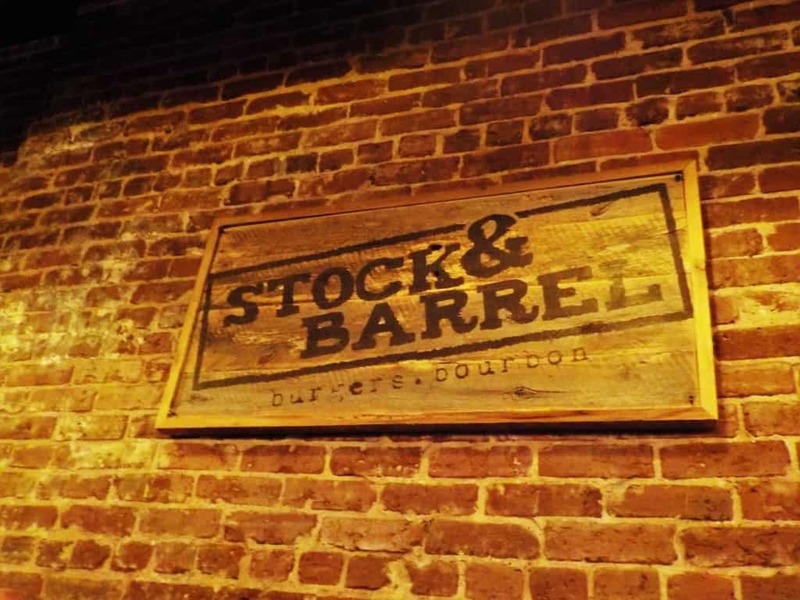 Stock & Barrel tries to limit this by creating a network of suppliers from all around the Knoxville region. For instance, the beef for their burgers is raised on a local farm that has been in existence since the 1800’s. A local bakery provides all of the breads they use, and most of the mixers for their drinks are created in-house. Most of you who follow our blog know that we will usually try to dine just off the peak hours. It allows us to minimize our wait time, but still get a good feel for the service when it is busy. At Stock & Barrel, it appears that they don’t have much of an off-peak session. We arrived at what we expected to be an early dinner, and the place was packed. A nice feature was them taking our phone number with the promise of a text when our table would be ready. This allowed us a few minutes to explore more of the Market Square. When our text arrived, we made a beeline for the restaurant and were seated immediately. Nearby, we made note of the delicious looking plates that our neighbors were enjoying. Soon enough, our orders were placed and we sat back to people watch. The buzz of the crowd certainly added to the anticipation of our meals. Even with the abundant crowds, we found the wait for our food to be normal. The founders of Stock & Barrel realized the importance of picking a niche and sticking with it. By developing a menu around a specific cuisine, in this case burgers, it allows them to hone their recipes to near perfection. As our server placed our meals in front of us, the aroma of the fresh cooked beef was tantalizing. Crystal is one who likes to go old school, so her choice was the ‘Merican Burger. The fresh beef patty is topped with American cheese, and all of the accompaniments you would expect to find at an outdoor cookout. Her side of fries had a delicious crispness. I knew Crystal would never go for the ‘Shroomin Burger, since she is not a big fan of mushrooms. Fortunately, I like them enough for both of us. This version is actually topped with three varieties, so when I saw it on the menu it was a done deal. Throw in some Swiss cheese and creamy horseradish, and I was a happy camper. 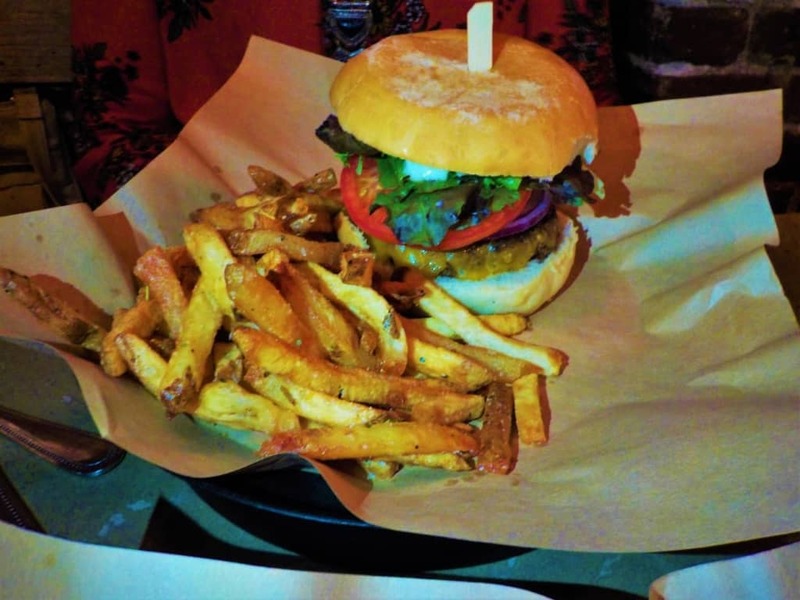 The use of locally sourced fresh beef truly adds a layer to the taste of the burgers at Stock & Barrel. Since they offer a choice, I decided to pick the onion rings, so we could sample both side options. These golden rings have a good proportion of batter to onion and make a good addition to a sandwich that doesn’t include onions. We savored our meals and even had an opportunity to speak with some of the staff. Everyone seemed thrilled for the chance to tell us about their favorites at Stock & Barrel. It was obvious that they all take pride in delivering the best tastes to their customers and it showed in all aspects of our visit. With our meals complete and others waiting for a table, we said our farewells and returned to Market Square. Having enjoyed an early dinner, we now had full bellies and plenty of time to explore the shops. 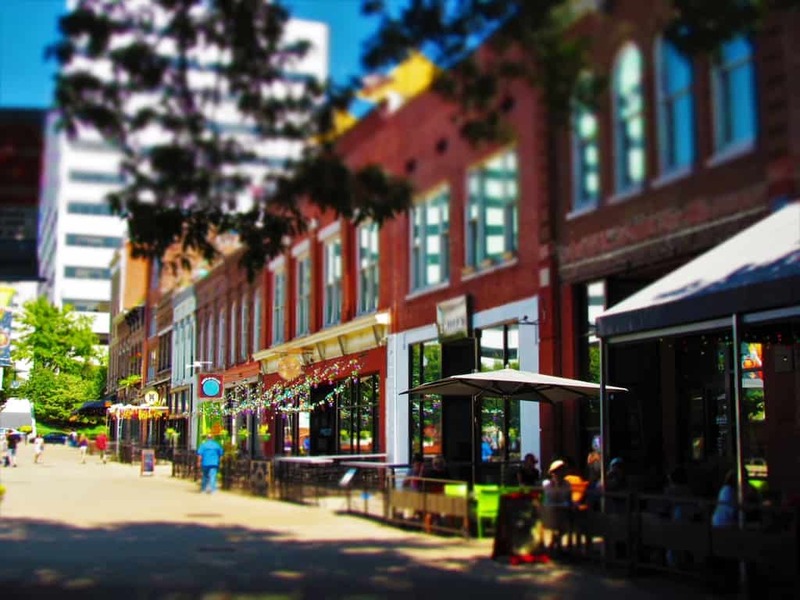 When you make your vacation plans for Knoxville, you will definitely want to add a visit to Market Square to your schedule. It’s sure to be a memory in the making. So which of the two burgers that we ordered would you prefer? 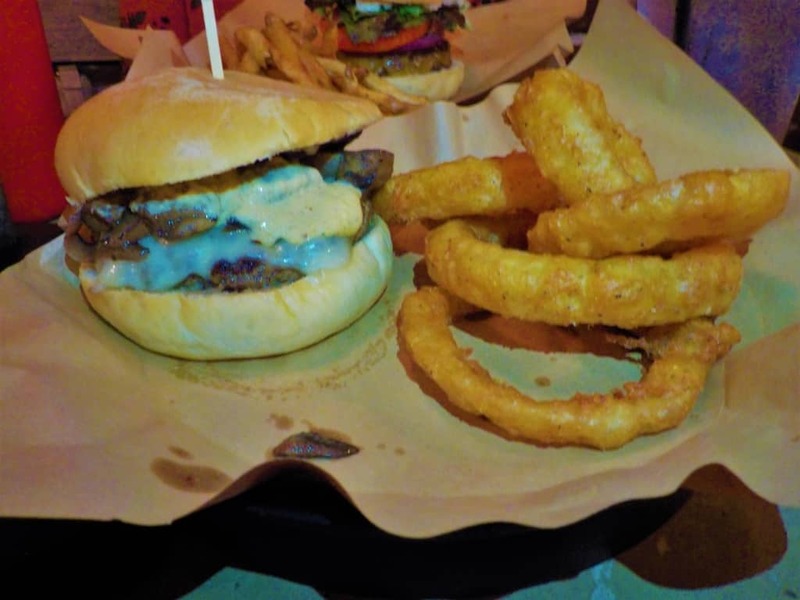 Share this with a burger lover!